Come and discover Kandy, with every attraction the city reveals itself enchanting. Discover a place where music gains a different melody, silence is broken by the city adrenaline on the way to modernity, and the mystery is revealed to all travelers who enjoy a mix of history, culture and lots of excitement. But of all that you can see in Kandy, there is a place to avoid. Read through the article and discover this place. It is a city that will surely exceed your expectations. Kandy is a beautiful city, a little smaller than Colombo, but not quite a village like Ella. Want an adrenaline rush, panoramic views, magnificent temples, lovely lakes, direct contact with wildlife, local rituals and dances and lots of good food? Kandy has all of that. Embark with us on this trip to Kandy, a place that will surely mark your life in every way! Where is Kandy in Sri Lanka? Places to visit in Kandy? How to move around Kandy? What are the best restaurants in Kandy? How many days you should stay in Kandy? Kandy is close to Ella in central Sri Lanka and is a bridge for a revealing journey into the hills of the teas. There are truths in these paths that we discovered and revealed to you in this article: Kandy to Ella: Know all the facts hidden in this lovely adventure. But, Kandy is much more, and we will reveal why she is so revered by Buddhism fans and tourists from all over the world. Kandy is one of the largest cities in Sri Lanka. It is a busy city with about 125 thousand inhabitants. It is a similar city Columbus, but it gains the prominence by its mountains and by being known worldwide as the heart of the Buddhism. With so many attractions in Kandy, it is impossible to list them all. Feel free to relax in a stupa or watch a performance filled with magic and excitement. Welcome to Kandy a city that has all the sensations for you to feel. With that in mind, we prepared the best attractions and stay tuned for the last one. It is a complaint. Be careful not to be deceived by what appears, because it has an obscure end! 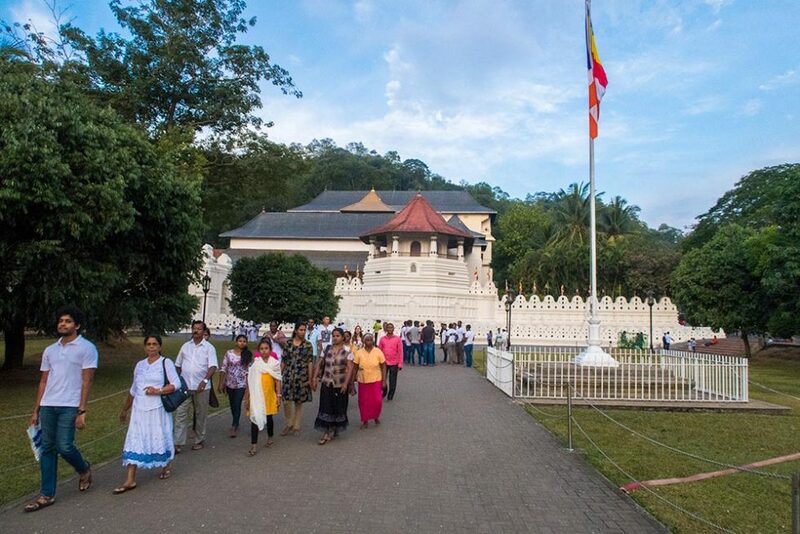 The Temple of the Tooth is one of the most important shrines not only of Kandy but of Sri Lanka. During the year he receives many visits for devotees to worship Buddha’s Tooth. They take advantage of the on-site ceremonies and appreciate the ivory statues that adorn the Temple. The Temple has been redesigned, and you will be impressed with the modern structure that the Temple presents, beginning with the beauty of the garden just outside the entrance. 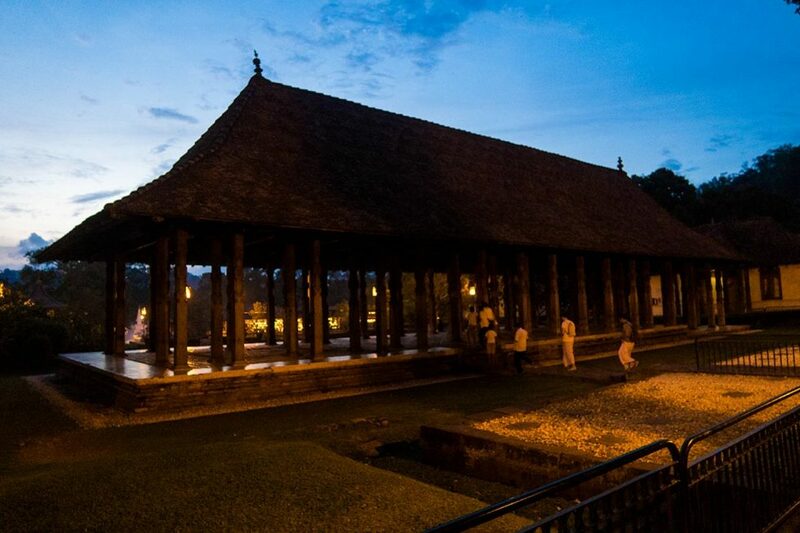 Temple of the Tooth is very close to Lake Kandy and within walking distance of the city center. Because of its location, it is a quiet place that inspires a lot of peace to visitors. If you want to enter the temple garden, make sure you are in the right attire: shoulders and legs covered. If in case you are not, in any place near where you will find the stores that sell the traditional sarongs – official dress of the monks. Even if you are wearing shorts that are allowed, they invite you to buy sarongs at these stores. Maybe it’s a way to increase the sales of the small dealer. In the garden, you can walk shoes without a problem, but for you to enter the Temple, there you will leave the shoes in an appropriate place. In that case, you will pay about 100 rupees when you get up. If you do not like to walk barefoot, then bring comfortable socks. Before entering the temple, you have to buy your ticket, at the tourist price, of course, for 1500 rupees. Right next to the ticket office you will find temple guides, available to guide you, for the right price, of course. Well, ignore them since, in the end, they will charge a high price (about 1500 rupees) for the service they provide. They explain only the translations of the plates and nothing else. In reality, it does not pay you to pay for a guide, it pays you to go and feel the energy of the environment. The best time to visit the Temple of the Tooth is at 18:30. It is at this time that the daily ceremony begins, with the drums echoing throughout the temple, and also the moment when the concentration of people is more significant. The highlight there, as the name says, is Buddha’s own Tooth. It’s tightly locked in a golden vault, inside the temple on the second floor so you will not see it, but you can come up to see the vault. There is only one way to get to the safe: after passing the crowded room, you will have to enter a narrow hallway full of people. If you’re curious, just look at the line and wait your turn. 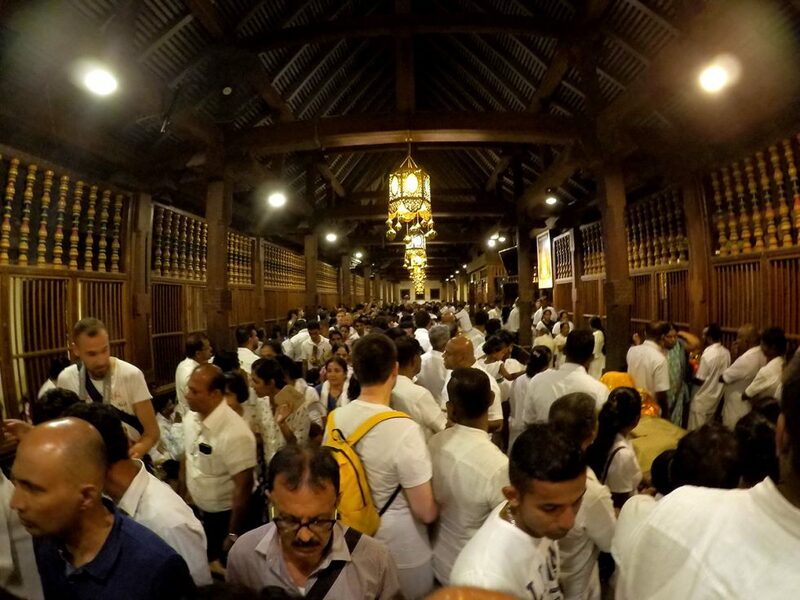 Amid a crowd of people lining you, you will be gazed at by the chest that holds the Buddha’s tooth. The passage is fast, and it is expressly forbidden to take photos inside the environment. Outside of the Temple of the Tooth are other smaller temples including a Buddhist pagoda, very typical in countries like Nepal. The Temple of the Tooth is the first place for you to meet and relax from the hustle and bustle of the trip. The Dali Museum Maligawa is one of the places that most portray the history and evolution of Buddhism in the country. It is close to the Temple of the Tooth and not visiting it is a mistake. You will be able to know the different philosophies of Buddhism and how these teachings have been expanded all over the world. If you like culture and history this is a place you should visit as soon as possible. Lake Kandy is nearer or better, its waters protect the Temple of the Tooth. It’s in a quieter area, maybe this attraction is one of the best of your trip. It pays to stop to feed the migrating birds, enjoy the fresh air because of the lush planting and stroll the pond feeding the ducklings. In the eighteenth century when the ruler of Kandy determined that the lake was created, many people opposed it. These people were slain in the middle of the lake. The Bahirawakanda Vihara Buddha statue stands next to the tea plantations being a pilgrimage spot for Buddhists. This statue is giant and noticeable from any point in Kandy, Sri Lanka. If you walk, prepare to climb the steep stairs, it will take about 30 minutes. If it is tuk-tuk is faster. Anyway upon arriving you will be rewarded with a beautiful view of Kandy. Also, while visiting the place, relax listening to the typical Buddhist singing. At any moment the statue is lit up being the stage of worship and reverence by the Buddhists. It has a new look because it is always retouched to maintain brightness and vivid color. Again remember to go in proper attire and do not take selfies offshore for the statue. When you return, rest assured that within a maximum of 15 minutes you will be back down to Kandy, Sri Lanka. 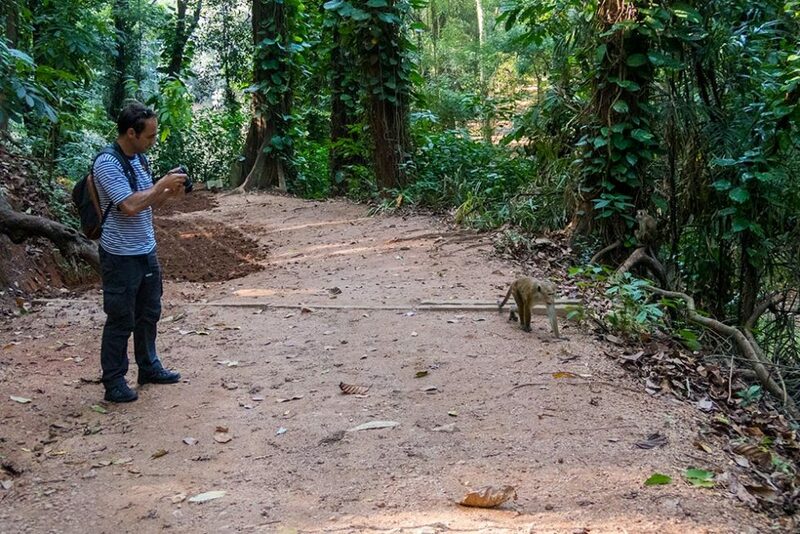 The Udawattakele Forest Reserve in Kandy is home to several species of mammals. This park is about a 20-minute walk from Temple of the Tooth. The park entrance is on the right side of the Tapovanaya Monastery. They charge a fee to visit the place. 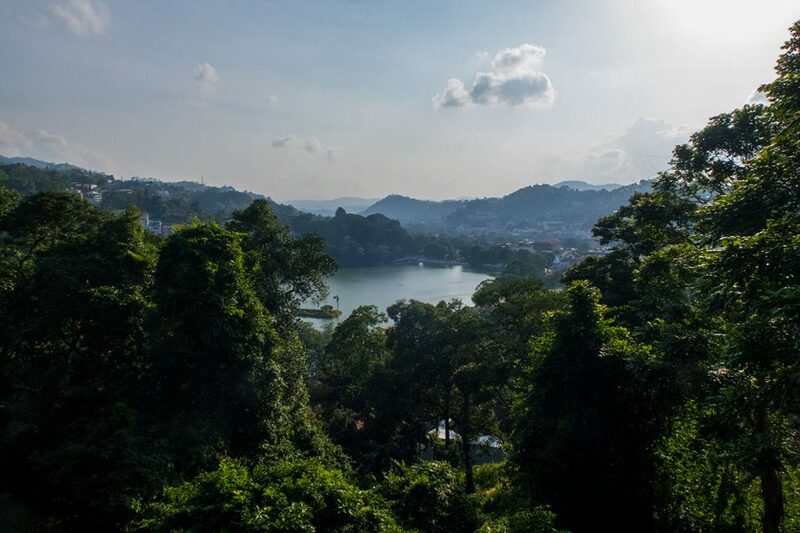 In ancient times, this forest reserve was once the refuge of the kings of Kandy. Today it is a quiet place with essential points for meditation and relaxation. As you stroll through the park, you will see various information boards explaining the diversity of animal and plant species. A real jungle in the heart of Kandy. The Kandy Municipal Market is a place where several shops sell clothes, accessories, jewelry, handicrafts, typical and imported fruits. This market is close to the train station and on the way to the Udawattakele Forest Reserve. The fruits they sell are more expensive than the other trades in the city. Because of this, we recommend that before you buy, ask the price first and try to negotiate. You can take advantage to buy some fruit of your choice to eat during your trip to Kandy. There are 4 waterfalls in Kandy that are close to each other. These beautiful places are close to the Knuckles Mountain range outside of Kandy and still little publicized. The waterfalls stand on top of the hills, and you can imagine the visibility it offers! Enjoy to relax, dive or merely to see the tea plantations. 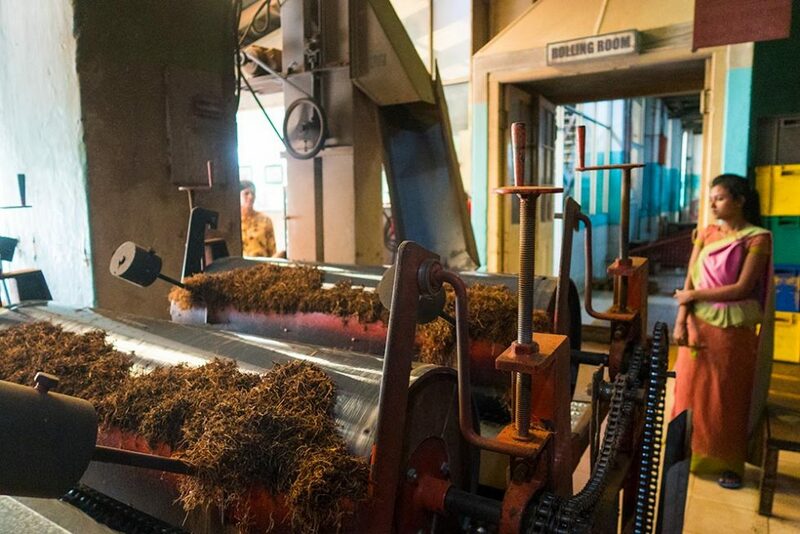 The Tea Factory is a place for you to see up close the cultivation of the teas and how they are prepared because they will be tasty and are the best in the world. 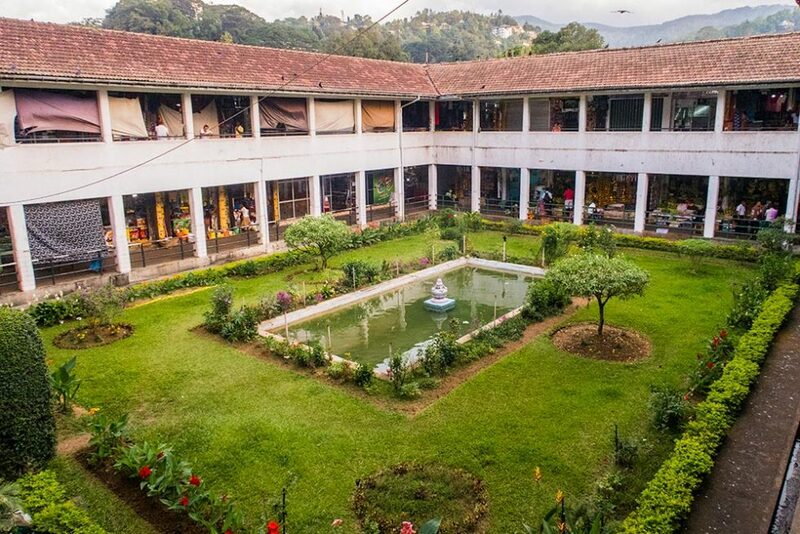 The Chás Factory is located far from Kandy and has beautiful plantations that will fill your eyes with such beauty. At the top of the Hills and outside of Kandy, meet the tea plantations. You will see the cultivation and how this process is done until it is prepared and served to the visitors. At the end of the tour, you can buy the best teas they produce. We suggest you purchase traditional green tea without the exotic flavors they sell. Natural green teas are more delicious. The Botanical Garden of Kandy is a place marked by tall green trees. It is worth spending to relax and take beautiful photos. This garden is outside the city, and according to reports, it was created so that royalty could enjoy. It pays to reserve an hour that is enough to see the trees, the birds and the rare collections of orchids. By being a quiet environment, you will always find monks with their habits. The spice garden is a place where they plant and cultivate the plants that give rise to the most famous spices in the country. It is about 20 minutes from Lake Kandy and right next to the botanical garden. The tour to know is free. The traveler walks through the trees, and the guides teach the processes of extracting some plants. There is a traditional shop selling spices such as the “Salacia reticulata wight” bark efficient in glycemic control. The prices that they usually charge are well above the normal ones check well if it pays to buy. Some travelers get a massage, but make no mistake they are usually expensive and fast. 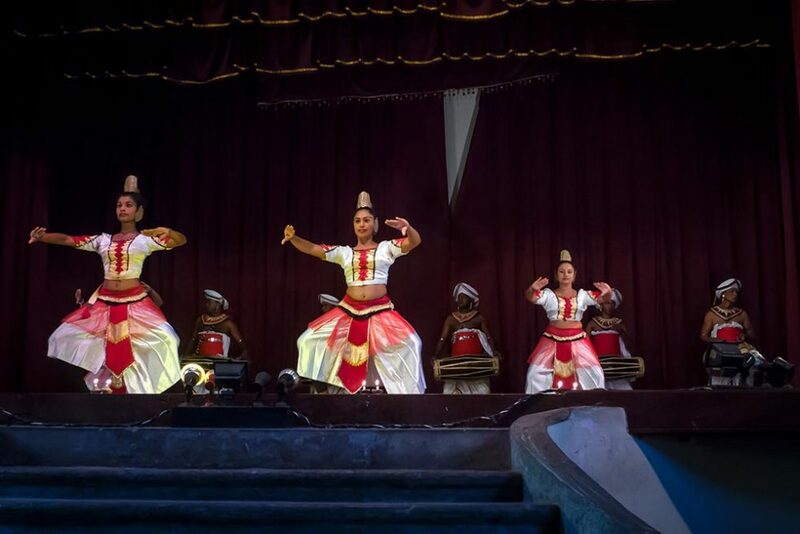 The dance and drums show in Kandy is an impossible ritual to resist. The dance itself is very energetic, vibrant and full of movements. Men and women in colorful clothes dance and dance to the drums. These dances are not at all conventional. They dance imitating the peacock’s movements, balancing the drums, jumping through the air. 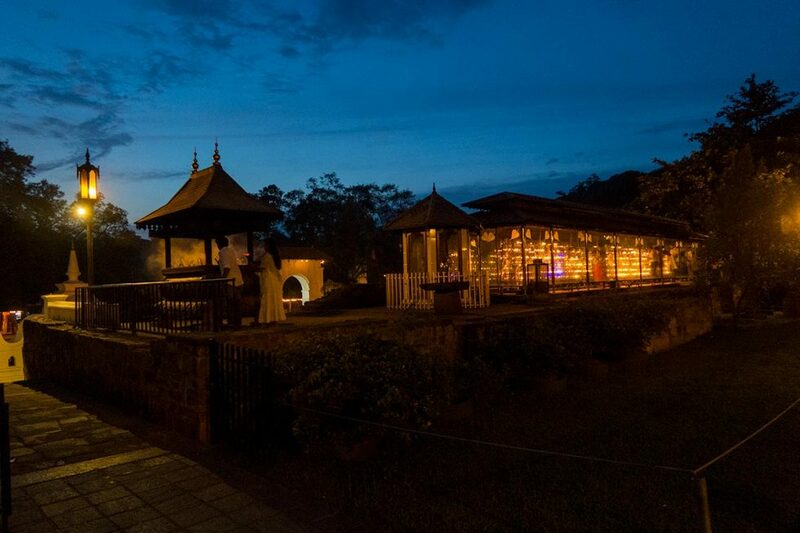 Kandyan Art Association & Cultural Center: on the north side of Lake Kandy. Kandy Lake Club: Located near Sanghamitta Mawatha. Mahanuwara YMBA: near the southwest region of Lake Kandy. The Commonwealth Cemetery is a memorial regarding the English men who died during World War II and even some of World War I. The site is well-kept, the tombs are well-kept and surrounded by grasses and flowers. Being a quiet place, it is much sought after by the travelers of the world who pay homage and revere these warriors. 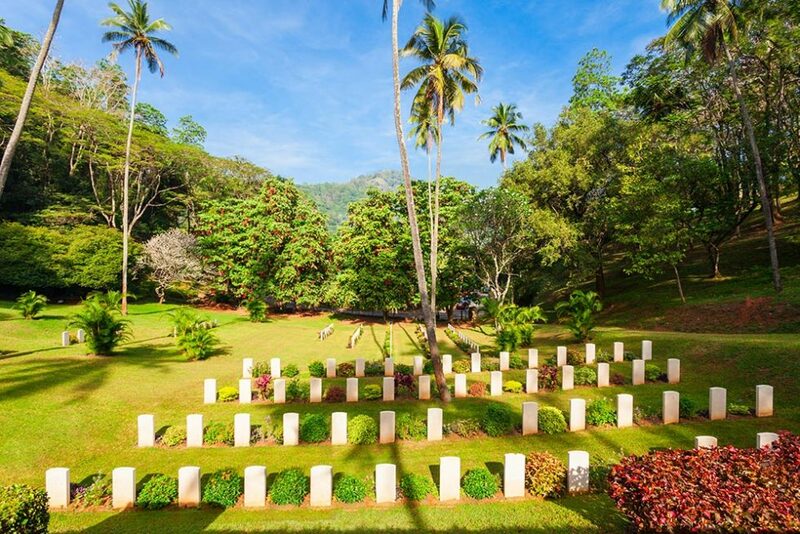 This is one of several well-tended cemeteries in Sri Lanka with economic support from the British. Do you remember that obscure place we mentioned at the beginning of the article? Well, it’s the Kandy Elephant Orphanage, a home where many elephants live outside of their natural habitat, and nothing is as it seems. 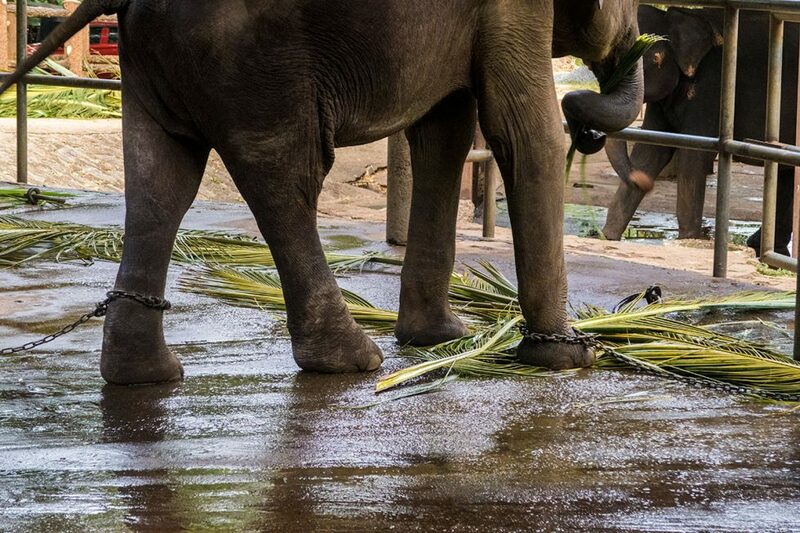 An elephant orphanage is a place where many elephants live in unconventional ways. This place is an abuse, and we will explain why. It is located in Rambukkana and was formerly under control of the Sri Lankan government. In fact, it all started when the country’s government came up with the idea of creating an orphanage to house the elephants who lost their herd during the war against the Tamil Tigers. But the good intentions stayed with the days counted and began the greater open exploration of elephants in Kandy. Because these elephants are brought from the jungle, taken from their herd and, are locked and exposed to a scorching sun poorly fed. They only get food when the gates open, and the uninformed tourists have fun feeding them with crumbs. Unfortunately, this orphanage is not the only one, there are many other explorers, and they compete with each other. They are almost all in the same area of Kandy, suggesting incredible moments like an elephant walking, but have no doubt that these animals are suffering, a lot. Do not be fooled by this video recorded there. Such as those who are on the road, stuck in the sun for all to see, especially tourists. But they could not be doing worse to this noble animal. We recommend that you do not go to this orphanage and report these mistreatments. Kandy, it’s a small town so you’ll save money on transportation to see the main attractions, especially when they’re nearby. The Temple of the Tooth, the lake of Kandy, the Natural Park, the Municipal Market, and the train station, you can go on foot. Now to climb the hill and see the Buddha statue, elephant orphanage and tea factory the best solution is the tuk-tuk. Although the prices are not so abusive, the ideal is to negotiate. 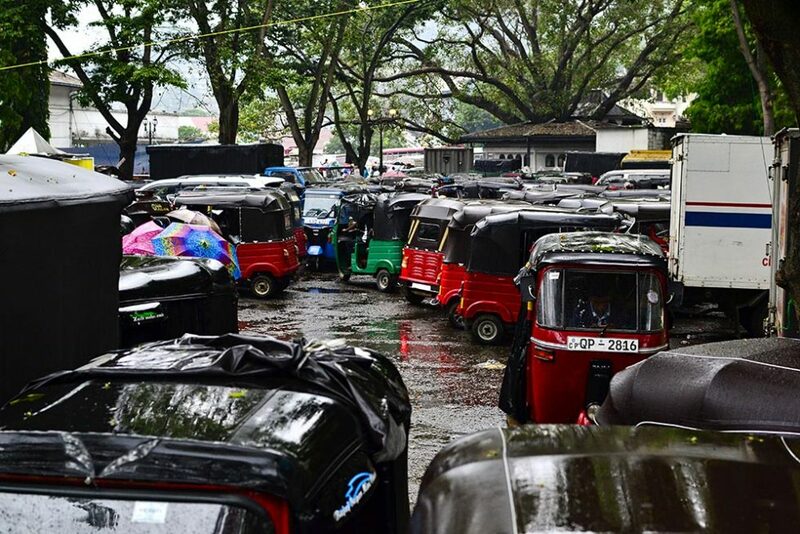 And speaking of displacement, check out our full article on transportation in Sri Lanka and learn how to dodge charlatans. 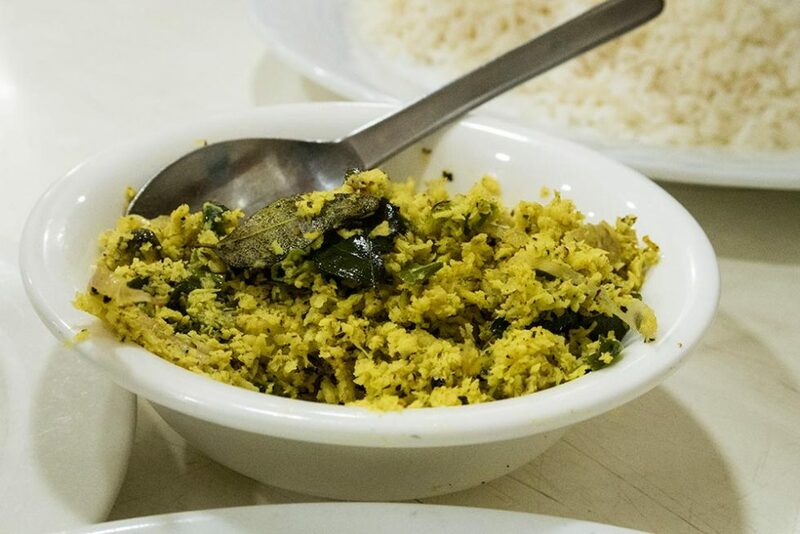 Check out a list of the best restaurants and bars and savor the best of local cuisine as well as have the opportunity to experience the typical dishes of other countries with a distinctive Sinhalese flair. The local Siri Ramya restaurant is quiet, and tourists rarely go there. This restaurant serves typical Sinhalese, Chinese, and even Thai foods. They also serve Kothu, the typical dish of the country. The Devon Place Restaurant is a restaurant serving mostly Indian and Chinese foods. Close to the Temple of the Tooth, in this Indian restaurant, you will be able to taste some Indian food, serving with the mildest flavor of India. Try the curry, with chicken, fish, and vegetables is a dish they do not abuse in the seasoning. But, always confirm the menu before choosing your food. 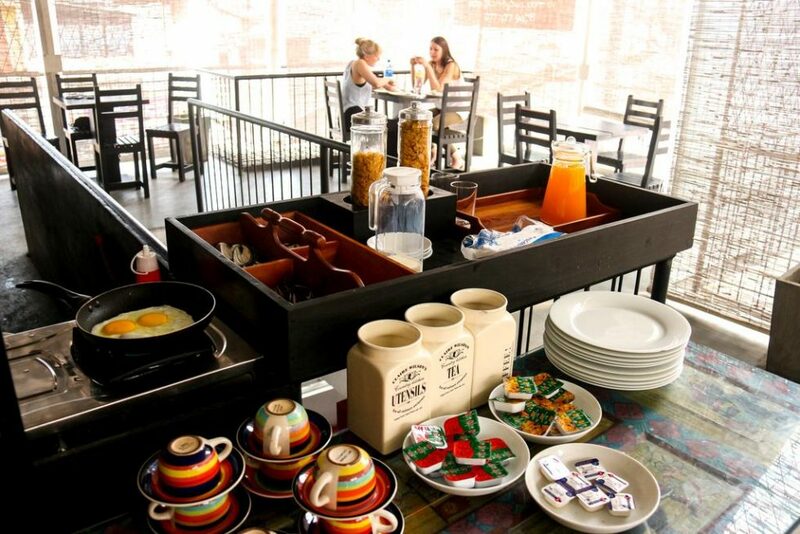 Café 1886 by Salgado is a charming, two floors cozy restaurant well known by locals and tourists. This restaurant is more touristy and very well referenced on the nomination sites: TripAdvisor and Lonely Planet. They serve various types of food from salad to more spicy and spicy foods and the famous Kothu (fried rice, egg, chicken, fish, seafood). 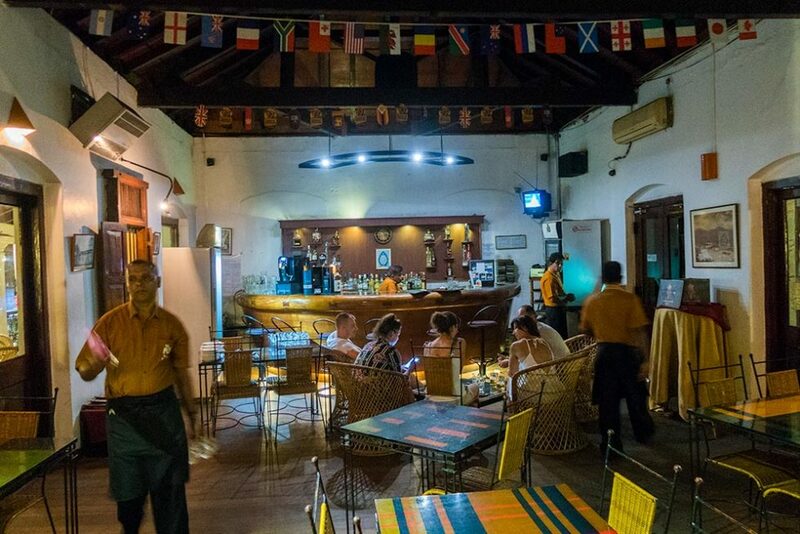 The Pub is a bar serving various types of drinks such as the typical Sinhalese Lion beer, whiskey, gin, and others. Try to go at night, but do not go past 10pm to sit in the outside area and to the sound of a music watch the movement of the street. In the next few lines, you will see our suggestion of the best hostels and hotels suggested and reviewed by travelers on TripAdvisor and Booking. 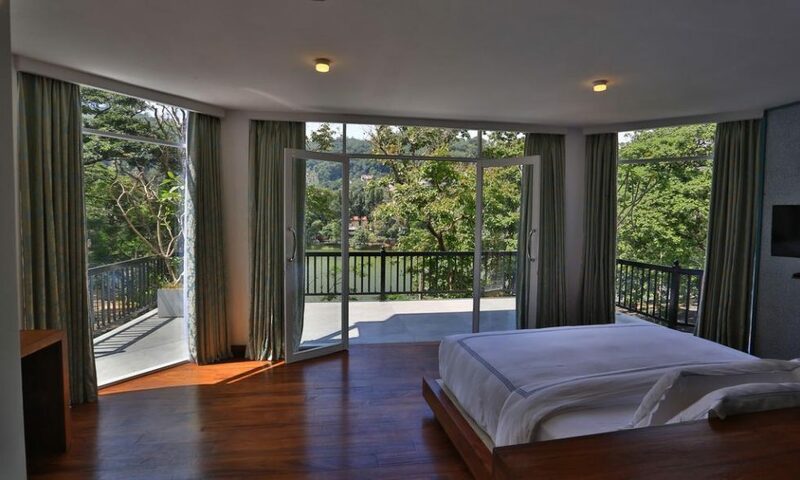 Feel free to choose the accommodations according to your commercial availability and expectation for your trip in Kandy. The Clock Inn Kandy is a more modern hotel, and it is close to the city center and the Buda statue. And a very comfortable hotel the rooms have air conditioning and options for bunk beds or beds. The difference is that it serves a complimentary breakfast. Also, you’ll find there free wifi and free parking. The Kandy City View Hostel is a simple yet comfortable place. It is close to the National Museum and the Malwathu Maha Viharaya Temple. The atmosphere is pleasant, and you will find other travelers like you to make friendships and exchange experiences. The rooms have simple ventilation and modest facilities with an option to choose between bunk beds or double beds. The differentials of this hostel are that it offers a picnic area and swimming pool for recreation. Sharon Inn is a hotel with an elegant entrance it is located next to the Temple of the Tooth, a dance club of Kandy and the Kandy Cemetery. The hotel facilities are modest but charming. They serve breakfast, they provide laundry services. If you want an exclusive room for non-smokers and air conditioning, you will like the Sharon Inn. Viyana Boutique Hotel is a luxurious and comfortable place. It is close to the Temple of the Tooth and the lake of Kandy. How about waking up, looking out the window and contemplating the view and the pure air of nature is the maximum, right? The wood-fired facilities and furnishings add a unique and sophisticated touch to the hotel. If you are willing to pay a little more and enjoy amenities like hot tubs and surreal views, the Viyana Boutique Hotel is your place. The Elegant Hotel goes by the same budget level as the previous one. The hotel is very charming and offers you a private relaxing area. Well, the Elegant Hotel offers this and more. It is located next to the Kandy Botanical Garden. In addition to the sophisticated facilities, the hotel serves breakfast with a variety of Sinhalese, Indian and Thai dishes. The weather in Kandy warm during the 12 months and the temperatures rotate around 15º to 35º, never goes beyond that. Kandy always suffers from monsoon seasons. Avoid going between April and September and in October and November, when the Maha monsoon occurs. These monsoons occur in various parts of Sri Lanka and bring natural disasters such as floods and windstorms. The best time to visit in Kandy is between mid-December and mid-March. Want to know more about the monsoons and what parts of the island does it reach? Check out this full article on the climate in Sri Lanka. As we have seen, Kandy is a lovely city and worthy of your visit. It is not just a bridge to travel by train to Ella. 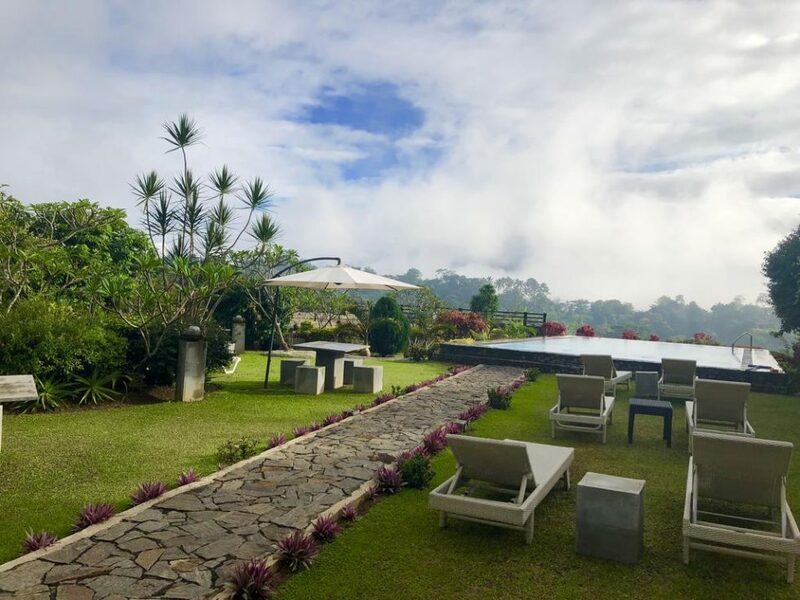 Kandy is a city that deserves to stop you and according to your mood choose from the main attractions of the busiest parties to the most relaxing places. Schedule yourself to stay for 3 days, and we assure you that it will still be insufficient. The attractions are so vibrant and exciting that it is impossible to describe all the feelings. 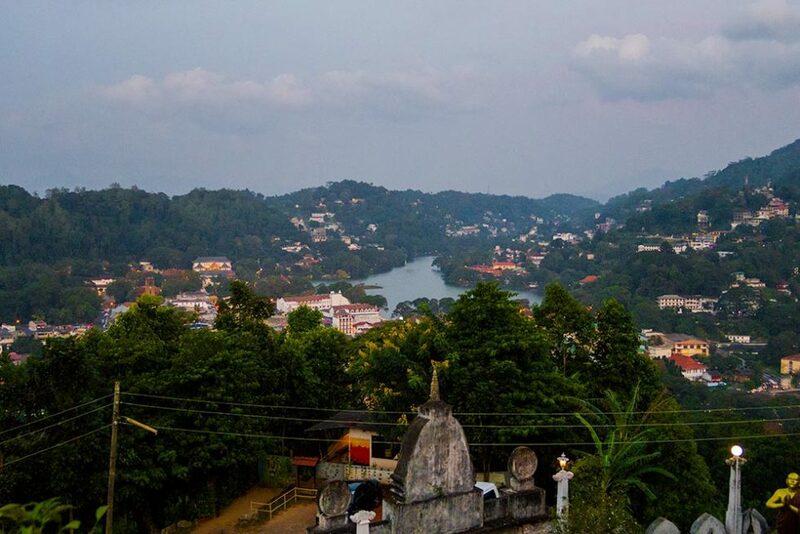 As you have seen, religiosity, culture and environmental preservation are standard features in Kandy. 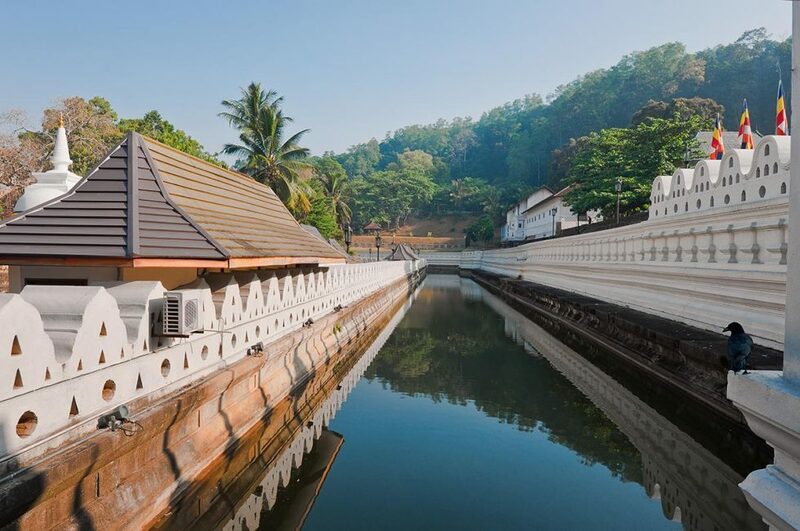 This place reveals a unique culture, and it is no wonder that Kandy was declared a World Heritage Site by Unesco. Do you like Kandy Sri Lanka? See how revealing she is and with all her emotions at the same time? 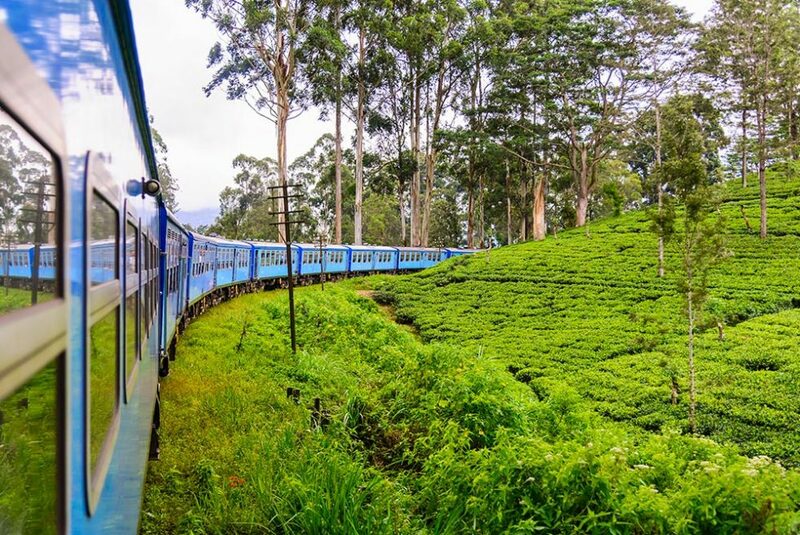 Check out the other cities and plot the complete itinerary on your trip to Sri Lanka. Venha descobrir Kandy, a cada atração a cidade se revela encantadora. Descubra um lugar onde a música ganha uma melodia diferente, o silêncio é quebrado pela adrenalina de cidade a caminho da modernidade e o mistério é revelado a todos os viajantes que gostam de uma mistura de história, cultura e muita emoção. Mas de tudo aquilo que pode ver em Kandy, há um lugar a evitar. Leia até ao fim o artigo e descubra esse lugar. É uma cidade que certamente vai superar as suas expectativas. Kandy é uma cidade bela, um pouco menor que Colombo, mas não chega a ser uma aldeia como Ella. Quer um lugar de adrenalina, vistas panorâmicas, templos magníficos, lagos encantadores, contato direto com a vida selvagem, rituais e danças locais e muita comida boa? Kandy têm. Embarque conosco nessa viagem a Kandy, um lugar que certamente vai marcar a sua vida em todos os aspectos! Onde fica Kandy no Sri Lanka? O que visitar em Kandy? Como se deslocar em Kandy? 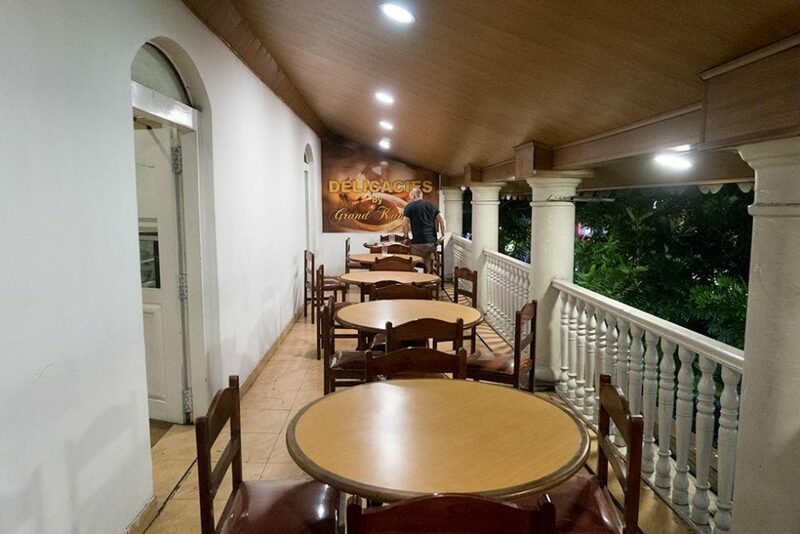 Quais são os melhores restaurantes em Kandy? Como é o clima e qual é a melhor época para visitar Kandy? Quantos dias ficar em Kandy? Kandy fica próxima a Ella na região central do Sri Lanka e é uma ponte para uma viagem reveladora até as colinas dos chás. Existem verdades nesses percursos que nós descobrimos e revelamos para você nesse artigo: Viagem de Kandy para Ella: Saiba as verdades que nunca te contaram. Mas, Kandy é muito mais e nós revelaremos o porquê ela é tão reverenciada pelos adeptos ao budismo e pelos turistas de todas as partes do mundo. Kandy é uma das maiores cidades do Sri Lanka. É uma cidade movimentada conta com cerca de mais de 125 mil habitantes. Ela é uma cidade semelhante Colombo, mas ganha o destaque pelas suas montanhas e por ser conhecida mundialmente como o coração do budismo. Com tantas atrações em Kandy é impossível listar todas. Fique à vontade para relaxar em uma estupa ou assistir a uma apresentação repleta de magia e emoção. Bem-vindo a Kandy uma cidade que tem todas as sensações para você sentir. Pensando nisso, preparamos as melhores atrações fique atento com a última. Ela é uma denúncia. Cuidado para não ser enganado pelo o que aparenta, porque possui um fim obscuro! O Templo do Dente é um dos santuários mais importante não somente de Kandy, mas do Sri Lanka. Durante o ano recebe muitas visitas para os devotos venerarem o Dente de Buda. Eles aproveitam para assistir às cerimónias no local e apreciarem as estátuas de Marfim que decoram o Templo. O Templo foi reformulado e você ficará impressionado com a estrutura moderna que o Templo apresenta, a começar pela beleza do jardim logo à entrada. O Templo do Dente fica bem próximo do Lago de Kandy e a uma distância a pé do centro da cidade. Pelo seu enquadramento, é um lugar tranquilo e que inspira muita paz aos visitantes. Caso queira entrar no jardim do templo, verifique se está com o traje adequado: ombros e pernas cobertos. Se caso não estiver, em qualquer local próximo dali você encontrará as lojinhas que vendem os tradicionais sarongs – veste oficial dos monges. Mesmo se estiver com uns calções no limite do permitido, eles te convidam a comprar uns sarongs nessas lojas. Talvez seja uma forma de aumentar as vendas do pequeno negociante. No jardim poderá andar calçado sem problema, mas para você entrar no Templo, aí deixará o calçado num local apropriado. Nesse caso pagará umas 100 rupias quando se levantar. Se não gosta de andar descalço, então leve meias confortáveis. Antes de entrar no templo, tem que comprar o teu bilhete, no preço de turista, claro, por 1500 rupias. Bem ao lado da bilheteira encontrarás os guias do templo, disponíveis para te guiarem, pelo preço certo é claro. Pois, ignora-os já que no final vão praticar um preço alto (cerca de 1500 rupias) para o serviço que prestam. Eles explicam somente as traduções das placas e nada mais. No real, não compensa você pagar por um guia, vale a pena você ir e sentir a energia do ambiente. A melhor hora para visitar o Templo do Dente é pelas 18h30. É nesse horário em que começa a cerimónia diária, com os tambores a ecoarem por todo o templo, sendo também o momento em que a concentração de pessoas é maior. O destaque lá, como o próprio nome diz, é o próprio Dente do Buda. Está bem fechado num cofre dourado, lá dentro do templo, no segundo piso, por isso nem verá, mas poderá se aproximar para ver o cofre. Só tem um caminho para chegar até o cofre: depois de passar pela sala cheia de gente, terá de entrar por um corredor estreito e cheio de pessoas. Se for curioso, basta encarar a fila e aguarda a sua vez. Em meio a uma multidão de pessoas na fila te empurrando, você será contemplado pelo cofre que guarda o dente de Buda. A passagem é rápida e é expressamente proibido tirar fotos dentro do ambiente. Fora do Templo do Dente tens ainda outros mais pequenos templos onde se inclui uma pagoda budista, bem típica em países como o Nepal. O templo do Dente é o primeiro lugar para você conhecer e relaxar da agitação da viagem. O museu Dalada Maligawa é um dos locais que mais retratam a história e a evolução do budismo no país. Ele fica próximo ao Templo do Dente e não o visitar é um erro. Você poderá conhecer as diferentes filosofias do budismo e como esses ensinamentos foram expandidos em todo o mundo. Se você gosta de cultura e história esse é um lugar que você deve visitar o quanto antes. O Lago de Kandy fica próximo ou melhor, as suas águas protegem o templo do Dente. Ele fica na região mais tranquila, talvez essa atração seja uma das melhores da sua viagem. Vale a pena você parar para alimentar as aves migratórias, apreciar o ar puro por causa da exuberante plantação e passear pela lagoa alimentando os patinhos. No século XVIII quando o governante de Kandy determinou que o lago fosse criado, muitas pessoas se opuseram a isso. Essas pessoas foram mortas a pauladas no meio do lago. A estátua Bahirawakanda Vihara Buddha fica próximo as plantações de chás sendo um ponto de peregrinação para os budistas. Essa estátua é gigante e perceptível de qualquer ponto de Kandy, Sri Lanka. Se for a pé, se prepare para subir pelas escadas íngremes, durará cerca de 30 minutos exaustivos. Se for de tuk tuk é mais rápido. 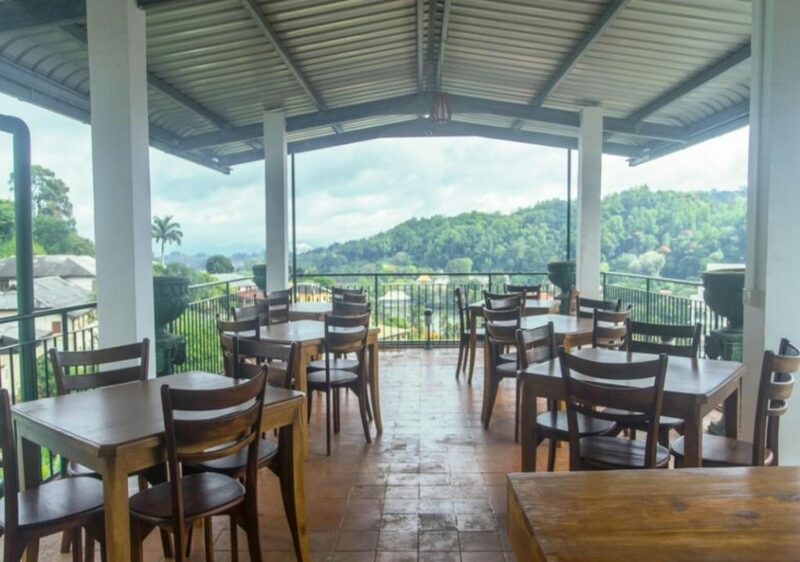 De qualquer forma ao chegar você será premiado com uma bela vista de Kandy. Além disso, enquanto visita o local, relaxe ouvindo o típico canto budista. Em qualquer momento a estátua está iluminada sendo o palco de adoração e reverência pelos budistas. Ela tem um aspecto novo, porque é sempre retocada para manter o brilho e a cor vívida. Mais uma vez lembre-se de ir com trajes adequados e não tire selfies de costa para a estátua. Ao retornar fique tranquilo que no máximo 15 minutos você já estará de volta descendo de volta a Kandy, Sri Lanka. A Reserva Florestal de Udawattakele em Kandy é um lar que abriga várias espécies de mamíferos. Esse parque fica cerca de 20 minutos a pé do Templo do Dente. A entrada do parque fica do lado direito do Mosteiro de Tapovanaya. Eles cobram uma taxa para visitar o lugar. Nos tempos antigos, esta reserva florestal já foi o refúgio dos reis de Kandy. Hoje é um lugar calmo e com importantes pontos para a meditação e relaxamentos. Ao passear pelo parque você verá várias placas informativas explicando sobre a diversidade de espécies de animais e vegetais. Uma verdadeira selva no coração de Kandy. O Mercado Municipal de Kandy é um local onde tem vários comércios que vendem roupas, acessórios, joalheria, artesanatos, frutas típicas e importadas. Esse mercado fica próximo à estação de trem e a caminho da Reserva Florestal de Udawattakele. As frutas que eles vendem são mais caras do que nos outros comércios da cidade. Por causa disso, recomendamos que antes de comprar pergunte o preço primeiro e tente negociar. Você pode aproveitar para comprar alguma fruta de sua preferência para comer durante a sua viagem em Kandy. Existem 4 cachoeiras em Kandy que ficam próximas entre si. Esses lugares são maravilhosos fica próximo a Cordilheira dos Knuckles fora de Kandy e ainda pouco divulgados. As cachoeiras ficam em cima das colinas e já dá para imaginar a visibilidade que oferece! Aproveite para relaxar, mergulhar ou simplesmente para avistar as plantações de chás. A Fábrica de chás é lugar para você ver de perto o cultivo dos chás e como eles são preparados, o porque eles serão saborosos e são os melhores do mundo. A Fábrica de Chás fica num lugar afastado de Kandy e conta com primorosas plantações que vão encher os seus olhos de tanta beleza. No alto das Colinas e fora de Kandy, conheça as plantações de chás. Você verá o cultivo e como esse processo é feito até ser preparado e servido para os visitantes. Ao final do passeio poderá comprar os melhores chás que eles produzem. Sugerimos que você compre o chá verde tradicional sem os sabores exóticos que eles vendem. Os chás verdes naturais são mais deliciosos. 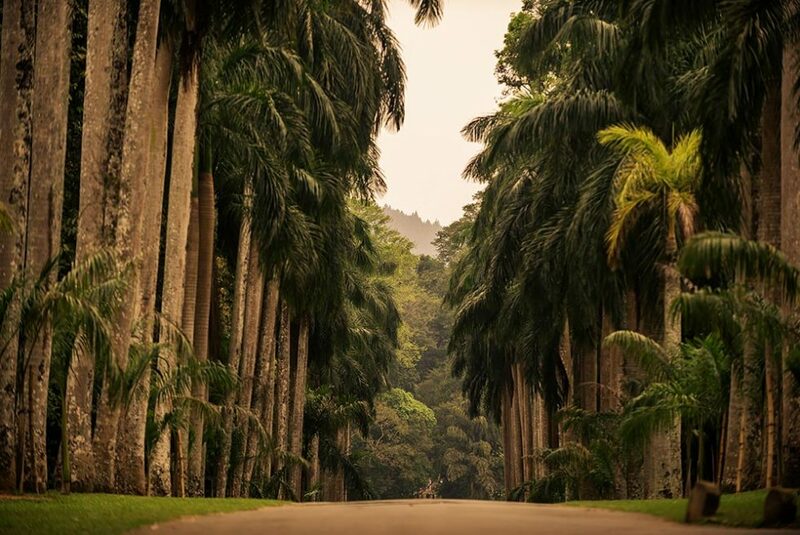 O Jardim Botânico de Kandy é um lugar marcado por árvores verdes e altas. Vale a pena passar para relaxar e tirar belíssimas fotos. Esse jardim fica fora da cidade, e segundo os relatos, ele foi criado para que a realeza pudesse desfrutar. Compensa você reservar 1 hora que já é suficiente para conhecer as árvores, os pássaros e as raríssimas coleções de orquídeas. Por se um ambiente calmo você sempre encontrará monges com os seus hábitos. O jardim das especiarias é um local onde plantam e cultivam as plantas que dão origem as especiarias mais famosas do país. Ele fica a cerca de 20 minutos do lago de Kandy e bem próximo ao jardim botânico. O passeio para conhecer é gratuito. O viajante passeia pelas árvores e os guias ensinam os processos de extração de algumas plantas. Existe uma loja tradicional onde se vende especiarias como as cascas de árvore “salacia reticulata wight” eficiente no controle da glicemia. Os preços que eles costumam cobrar são bem acima dos normais verifique bem se compensa comprar. Alguns viajantes conseguem umas massagens, mas não se engane elas costumam ser caras e rápidas. Os shows de dança e bateria no Kandy é um ritual impossível de resistir. A dança em si é muito enérgica, vibrante e cheia de movimentos. Homens e mulheres com roupas coloridas bailam e dançam ao som da bateria. Essas danças não são nada convencionais. Eles dançam imitando os movimentos do pavão, equilibrando os tambores, dando pulos pelos ares. Kandyan Art Association & Cultural Center: ao lado norte do Lago de Kandy. Kandy Lake Club: fica próximo ao Sanghamitta Mawatha. Mahanuwara YMBA: perto da região sudoeste do Lago de Kandy. O Commonwealth Cemetery é um memorial em respeito aos homens ingleses que morreram durante a II Guerra Mundia e até alguns da I Guerra Mundial. O local é cuidado, os túmulos são bem conservados e cercado pelas gramas e pelas flores. Por ser um lugar tranquilo, ele é muito procurado pelos viajantes de o todo mundo que prestam homenagens e reverenciam a esses guerreiros. Este é um dos vários cemitérios no Sri Lanka, bem cuidados, com apoio económico dos Ingleses. Lembra-se daquele lugar obscuro que mencionamos no início do artigo? Pois bem, é o Orfanato de Elefantes de Kandy, um local onde vivem muitos elefantes fora do seu habitat natural e nada é como parece. O orfanato de elefantes é um local onde vivem muitos elefantes de forma nada convencional. Esse lugar é um abuso e nós explicaremos o porquê. Ele fica localizado em Rambukkana e antigamente ficava sobre o controle do governo cingalês. Na verdade, tudo começou quando o governo do país teve a ideia de criar um orfanato para abrigar os elefantes que perderam a sua manada durante a guerra contra os Tigres de Tamil. Mas, as boas intenções ficaram com os dias contados e iniciou-se a maior exploração de elefantes a céu aberto em Kandy. Porque esses elefantes são trazidos da selva, retirados de sua manada e, são levados presos e expostos a um sol escaldante mal alimentados. Eles só recebem alimentos quando os portões se abrem e os turistas desinformados se divertem alimentando-os com migalhas. Infelizmente esse orfanato não é o único, existem muitos outros exploradores e eles competem entre si. 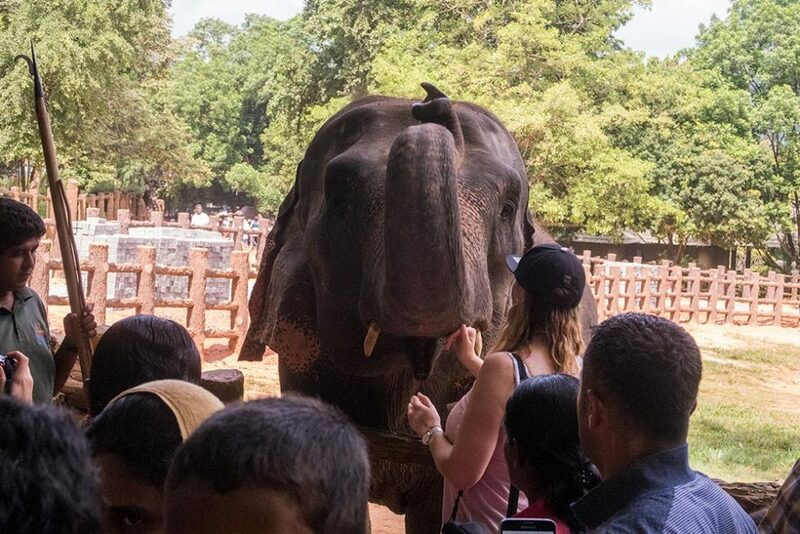 Ficam quase todos na mesma zona de Kandy, sugerindo momentos incríveis como andar de elefante, mas não tenha dúvidas que esses animais estão sofrendo, e muito. Não se deixe enganar por este vídeo registado lá. Tais como aqueles que estão à face da estrada, presos ao sol para que todos os vejam, sobretudo os turistas. Mas não poderiam estar a fazer pior a este nobre animal. Recomendamos que não vá a este orfanato e denuncie esses maus tratos. Kandy, é uma cidade pequena então você irá economizar no transporte para conhecer as principais atrações, principalmente quando forem próximas. O Templo do Dente, o lago de Kandy, o Parque Natural, o Mercado Municipal e a estação de trem, você pode ir a pé. Agora, para subir a colina e ver a estátua de Buddha, orfanato de elefantes e fábrica de chás a melhor solução é o tuk tuk. Ainda que os preços não são tão abusivos, o ideal é negociar. E por falar em deslocamento, confira o nosso artigo completo sobre transportes no Sri Lanka e saiba como se esquivar dos charlatões. Confira uma lista dos melhores restaurantes e bares e saboreia o melhor da culinária local além de ter a oportunidade de conhecer os típicos pratos de outros países com um toque diferenciado cingalês. O restaurante local Siri Ramya é tranquilo e os turistas quase não frequentam. Esse restaurante serve comidas típicas cingalesas, chinesas e até tailandesas. Eles também servem o Kothu, o prato típico do país. O restaurante Devon Place é um restaurante que serve comidas indianas e chinesas. Esse restaurante indiano fica próximo ao Templo do Dente. As comidas indianas que eles servem, possuem o tempero mais suave do que se encontra na Índia. Experimente o caril, com frango, peixe e vegetais é um prato que eles não abusam no tempero. Mas, sempre confirme o cardápio antes de escolher a sua comida. O Café 1886 by salgado é um charmoso restaurante bem acolhedor com dois andares. Esse restaurante é mais turístico e muito bem referenciado nos sites de indicação: TripAdvisor e Lonely Planet. Eles servem vários tipos de comidas desde salada a comidas mais temperadas e picantes e o famoso Kothu (arroz frito, ovo, galinha, peixe, marisco). O The Pub é um bar que servem vários tipos de bebidas como a típica cerveja cingalesa Lion, whisky, gin e outras. Tente ir a noite, mas não passe das 22h para sentar na área de fora e ao som de uma música ver o movimento da rua. Nas próximas linhas você receberá uma relação dos melhores albergues e hoteis sugeridos e bem avaliados pelos viajantes no site TripAdvisor e Bookking. Sinta-se à vontade para escolher as acomodações conforme a sua disponibilidade financeira, expectativa para a sua viagem em Kandy. O Clock Inn Kandy é um hotel mais moderno e ele fica próximo ao centro da cidade e a estátua de Buda. E um hotel que é muito confortável os aposentos possuem ar condicionado e opções para beliches ou camas. O diferencial é que ele serve café da manhã por cortesia. Além disso, o viajante terá wifi e estacionamento grátis. O albergue Kandy City View Hostel é um lugar simples mas confortável. Ele fica próximo ao museu nacional e ao templo Malwathu Maha Viharaya. O ambiente é agradável e você encontrará outros viajantes como você para fazer amizades e trocar experiências. Os quartos possuem ventilação simples e instalações modestas com opção para escolher entre beliche ou cama de casal. Os diferenciais desse albergue é que ele disponibiliza área para piqueniques e a piscina para recreação. O Sharon Inn é um hotel com uma entrada elegante ele fica localizado próximo ao Templo do Dente, a um clube de dança de Kandy e ao cemitério de Kandy. As instalações do hotel são modestas, mas charmosas. Eles servem café da manhã, prestam serviços de lavanderia. Caso você deseja um quarto exclusivo para não fumantes e ar condicionado você gostará do Sharon Inn. O Viyana Boutique Hotel é um lugar luxuoso e confortável. Ele fica próximo ao Templo do Dente e ao lago de Kandy. Que tal acordar, olhar pela janela e contemplar a vista e o ar puro da natura é o máximo, né? As instalações e os móveis amadeirados dão um toque especial e sofisticado ao hotel. Se você estiver disposto a pagar um pouco mais e desfrutar de comodidades tipo banheiras de hidromassagem e vistas surreais, o Viyana Boutique Hotel é o seu lugar. O Elegant Hotel entra na mesma linha do outro e mais um pouco. Ele é encantador, imagina você em uma área privativa relaxando? Pois bem, o Elegant Hotel oferece isso e mais um pouco. Ele fica localizado próximo ao Jardim Botânico de Kandy. 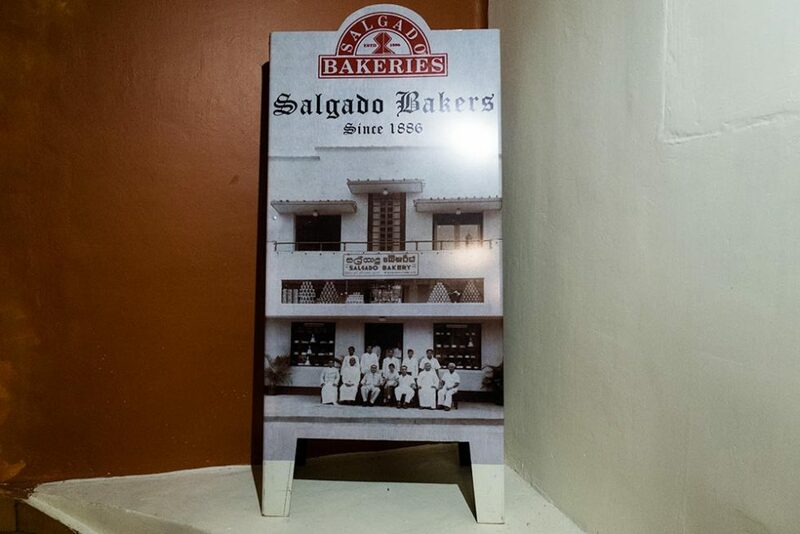 Além das instalações sofisticadas, o hotel serve café da manhã com uma variedade de pratos cingaleses, indianos e tailandeses. O clima em Kandy caloroso durante os 12 meses e as temperaturas giram em torno de 15º a 35º, nunca passa disso. Kandy sempre sofre com as temporadas de monções. Evite ir entre abril e setembro e nos meses de outubro e novembro, em que ocorre a monção Maha. Essas monções ocorrem em várias partes do Sri Lanka e trazem desastres naturais como inundações e ventanias. A melhor época para visitar em Kandy é entre meados de dezembro até meados de março. Quer saber mais sobre as monções e em quais partes da ilha ele atinge? Confira esse artigo completo sobre o clima no Sri Lanka. Como vimos, Kandy é uma cidade encantadora e que merece a sua visita. Ela não é somente uma ponte para viajar de trem para Ella. Kandy é uma cidade que merece você parar e conforme o seu humor escolher entre as principais atrações desde as festas mais agitadas aos lugares mais relaxantes. Programe-se para ficar uns 3 dias e lhe garantimos que ainda será insuficiente. As atrações são tão ricas e emocionantes que fica impossível descrever todos os sentimentos. Como você viu, a religiosidade, a cultura e a preservação ambiental são características predominantes em Kandy. Esse lugar revela uma cultura ímpar e não é toa que Kandy foi declarada Patrimônio da Humanidade pela Unesco. Gostou de Kandy Sri Lanka? Viu como ela é reveladora e com todas as emoções ao mesmo tempo? Confira as outras cidades e trace o roteiro completo em sua viagem ao Sri Lanka. Vem descobrir Kandy, a cada atração a cidade revela-se encantadora. Descobre um lugar onde a música ganha uma melodia diferente, o silêncio é quebrado pela adrenalina de cidade a caminho da modernidade e o mistério é revelado a todos os viajantes que gostam de uma mistura de história, cultura e muita emoção. Mas de tudo aquilo que podes ver em Kandy, há um lugar a evitar. Lê até ao fim o artigo para saberes que lugar é esse. É uma cidade que certamente vai superar as tuas expectativas. Kandy é uma cidade bela, um pouco menor que Colombo, mas não chega a ser uma aldeia como Ella. Queres um lugar de adrenalina, vistas panorâmicas, templos magníficos, lagos encantadores, contacto directo com a vida selvagem, rituais e danças locais e muita comida boa? É isso tudo que vais encontrar em Kandy. Embarca connosco nesta viagem a Kandy, um lugar que certamente vai marcar a tua vida em todos os aspectos! Como te deslocares em Kandy? Kandy fica próxima a Ella na região central do Sri Lanka e é uma ponte para uma viagem reveladora até as colinas dos chás. Existem verdades nesses percursos que nós descobrimos e revelamos para ti neste artigo: Viagem de Kandy para Ella: Saiba as verdades que nunca te contaram. Com tantas atrações em Kandy é impossível listar todas. Fica à vontade para relaxar numa stupa ou assistir a uma apresentação repleta de magia e emoção. Bem-vindo a Kandy, uma cidade que tem todas as sensações para sentires. Pensando nisso, preparamos as melhores atrações. Fica atento com a última. Ela é uma denúncia. Cuidado para não seres enganado/a pelo o que aparenta, porque possui um fim obscuro! O Templo do Dente é um dos santuários mais importante não somente de Kandy, mas do Sri Lanka. Durante o ano recebe muitas visitas para os devotos venerarem o Dente de Buddha. O Templo foi reformulado e ficarás impressionado com a estrutura moderna que o Templo apresenta, a começar pela beleza do jardim logo à entrada. Caso queiras entrar no jardim do templo, verifica se estás com o traje adequado: ombros e pernas cobertos. 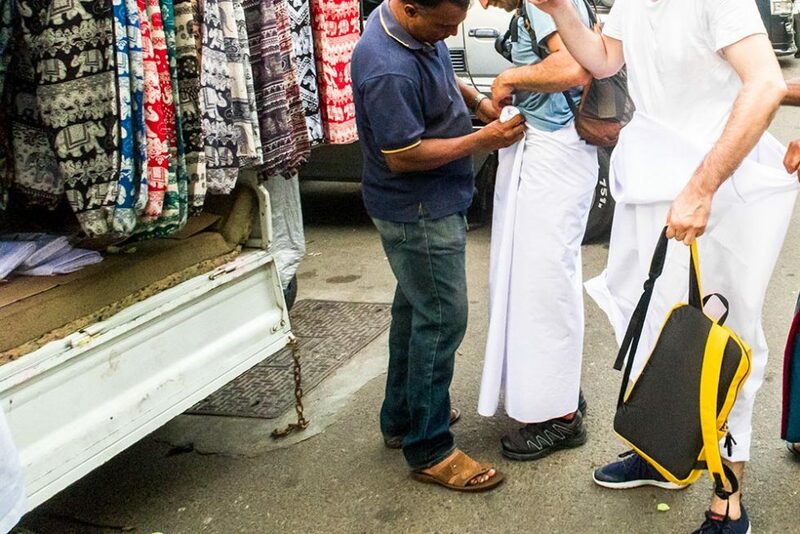 Se caso não estiveres, em qualquer local próximo dali encontrarás as lojinhas que vendem os tradicionais sarongs – veste oficial dos monges. Mesmo se estiveres com uns calções no limite do permitido, eles convidam-te a comprar uns sarongs nessas lojas. Talvez seja uma forma de aumentar as vendas do pequeno negociante. No jardim poderás andar calçado sem problema, mas para entrares no Templo, terás de deixar o calçado num local apropriado. Nesse caso pagarás umas 100 rupias no momento da recolha. Se não gostas de andar descalço, então leva umas meias confortáveis. Antes de entrar no templo, tens que comprar o teu bilhete, no preço de turista, claro, por 1500 rupias. Bem ao lado da bilheteira encontrarás os guias do templo, disponíveis para te guiarem, pelo preço certo é claro. Na verdade, não compensa pagares por um guia, vale a pena ires e sentir a energia do ambiente. O destaque lá, como o próprio nome diz, é o próprio Dente do Buddha. Está bem fechado num cofre dourado, lá dentro do templo, no segundo piso, por isso nem o verás, mas poderás aproximar-te para ver o cofre. Só tem um caminho para chegar até o cofre: depois de passar pela sala cheia de gente, terás de entrar por um corredor estreito e cheio de pessoas. Se fores curioso/a, basta encarares a fila e aguardar pela tua vez. No meio da multidão de pessoas na fila empurrando-te, serás contemplado pelo cofre que guarda o dente de Buddha. A passagem é rápida e é expressamente proibido tirar fotos dentro do ambiente. Fora do Templo do Dente tens ainda outros mais pequenos templos onde se inclui um pagoda budista, bem típica em países como oNepal. O templo do Dente é o primeiro lugar para conheceres e relaxar da agitação da viagem. Lá poderás conhecer as diferentes filosofias do budismo e como esses ensinamentos foram expandidos em todo o mundo. Se gostas de cultura e história esse é um lugar que deves visitar quando estiveres por Kandy. 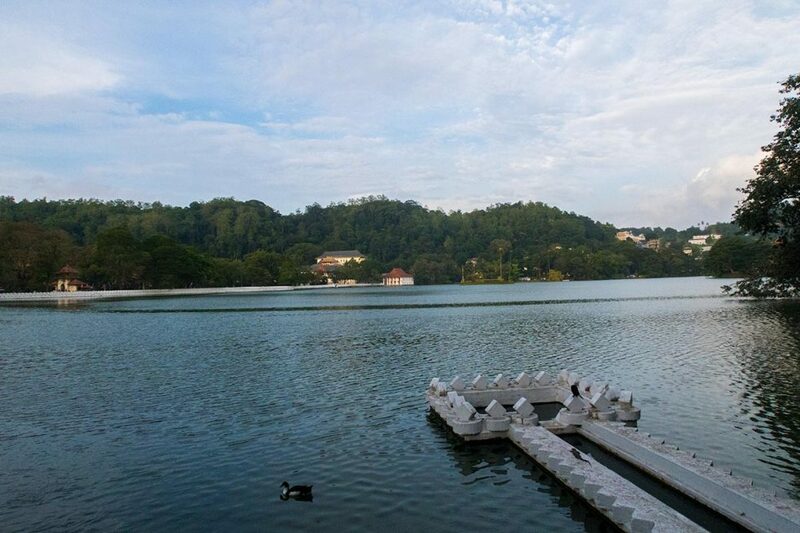 O Lago de Kandy fica próximo ou melhor, as suas águas protegem o templo do Dente. Ele fica na região mais tranquila, talvez essa atração seja uma das melhores da sua viagem por Kandy. No século XVIII quando o governante de Kandy determinou que o lago fosse criado, muitas pessoas se opuseram a isso. Essas pessoas foram mortas a atiradas para o meio do lago com estacas. 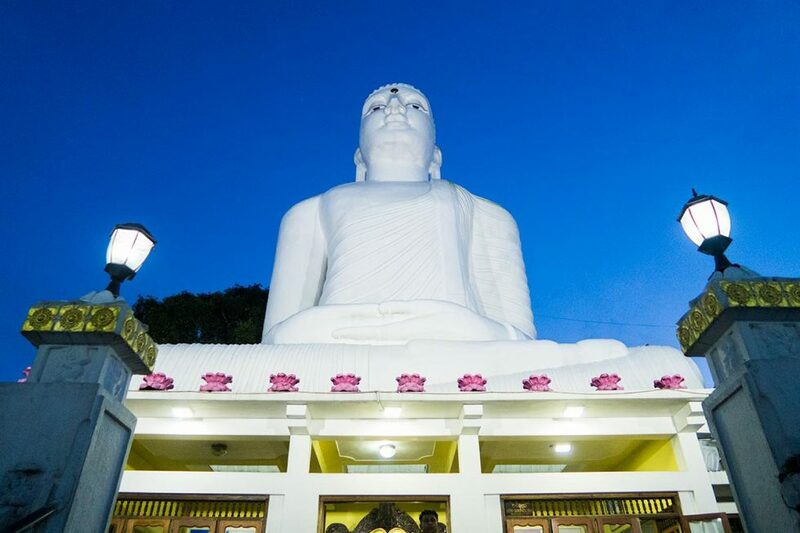 Essa estátua é gigante e perceptível de qualquer ponto de Kandy, Sri Lanka. Se fores a pé, prepara-te para subir pelas escadas íngremes, durando cerca de 30 minutos exaustivos. Se fores de tuk-tuk é bem mais rápido. De qualquer forma, ao chegares serás premiado com uma bela vista de Kandy. Além disso, enquanto visitas o local, relaxa e ouve o típico canto budista. Mais uma vez lembra-te de ir com trajes adequados e não tire selfies de costas para a estátua. Ao voltar fica tranquilo que no máximo, em 15 minutos já estarás de volta a Kandy, Sri Lanka. Esse parque fica cerca de 20 minutos a pé do Templo do Dente. A entrada do parque fica do lado direito do Mosteiro de Tapovanaya. Para entrar, terás de pagar uma taxa para visitar o lugar. Ao passeares pelo parque verás várias placas informativas explicando sobre a diversidade de espécies de animais e vegetais. Uma verdadeira selva no coração de Kandy. Esse mercado fica próximo à estação de comboio e a caminho da Reserva Florestal de Udawattakele. As frutas que lá vendem são mais caras do que em outras lojas de rua da cidade. Por isso, recomendamos que antes de comprar pergunta o preço primeiro e tenta negociar. Podes aproveitar para comprar alguma fruta de tua preferência para comer durante a sua viagem em Kandy. Existem 4 cascatas em Kandy que ficam próximas entre si. As cascatas ficam em cima das colinas e já dá para imaginar a visibilidade que oferece! Aproveita para relaxar, mergulhar ou simplesmente para avistar as plantações de chás. A Fábrica de chás é lugar para veres de perto o cultivo dos chás e como eles são preparados, o porque eles serão saborosos e são os melhores do mundo. No alto das Colinas e fora de Kandy, conhece as plantações de chás. Lá verás o cultivo e como esse processo é feito até ser preparado e servido para os visitantes. Ao final do passeio poderás comprar os melhores chás que lá produzem. Sugerimos que compres o chá verde tradicional sem os sabores exóticos que vendem. Os chás verdes naturais são mais deliciosos. Esse jardim fica fora da cidade, e segundo os relatos, foi criado para que a realeza pudesse desfrutar. Compensa reservar 1 hora que já é suficiente para conhecer as árvores, os pássaros e as raríssimas coleções de orquídeas. Por se um ambiente calmo, é normal encontrar monges com os seus hábitos a passear e meditar. O jardim de especiarias é um local onde plantam e cultivam as plantas que dão origem as especiarias mais famosas do país. Existe uma loja tradicional onde se vende especiarias como as cascas de árvore “salacia reticulata wight” eficiente no controle da glicemia. Os preços que eles costumam cobrar são bem acima dos normais, por isso, verifica bem se compensa comprar. Alguns viajantes conseguem umas massagens, mas não te enganes pois elas costumam ser caras e rápidas. Os shows de dança e bateria em Kandy é um ritual impossível de resistir. A dança em si é muito enérgica, vibrante e cheia de movimentos. Essas danças não são nada convencionais. Eles/Elas dançam imitando os movimentos do pavão, equilibrando os tambores, dando pulos pelos ares. O local é cuidado, os túmulos são bem conservados e cercado numa pequena floresta e muitas flores. Lembras-te daquele lugar obscuro que mencionamos no início do artigo? Pois bem, é o Orfanato de Elefantes de Kandy, um local onde vivem muitos elefantes fora do seu habitat natural e nada é como parece. Não te deixes enganar por este vídeo registado lá. Kandy, é uma cidade pequena então irás economizar no transporte para conhecer as principais atrações, principalmente quando forem próximas. O Templo do Dente, o lago de Kandy, o Parque Natural, o Mercado Municipal e a estação de comboio, podes ir a pé. Agora, para subir a colina e ver a estátua de Buddha, orfanato de elefantes e fábrica de chás a melhor solução é o tuk-tuk. Ainda que os preços não são tão abusivos, o ideal é negociar. E por falar em deslocamento, confere o nosso artigo completo sobre transportes no Sri Lanka e descobre como te esquivares dos charlatões. Descobre uma lista dos melhores restaurantes e bares e saboreia o melhor da culinária local além de ter a oportunidade de conhecer os típicos pratos de outros países com um toque diferenciado cingalês. Tenta ir a noite, mas não depois das 22h. Senta-te na área de fora e ao som de uma música enquanto observas o movimento da rua. Nas próximas linhas receberás uma relação dos melhores hostels e hoteis sugeridos e bem avaliados pelos viajantes no site TripAdvisor e Booking. Sente-te à vontade para escolheres as acomodações conforme a tua disponibilidade financeira, expectativa para a tua viagem em Kandy. O Clock Inn Kandy é um hotel mais moderno e fica próximo ao centro da cidade e a estátua de Buda. O diferencial é que ele serve café da manhã, já incluido no preço. Além disso, o viajante terá wifi e estacionamento grátis (se tiveres carro ou moto alugado). O hostel Kandy City View Hostel é um lugar simples mas confortável. Fica próximo ao museu nacional e ao templo Malwathu Maha Viharaya. O ambiente é agradável e encontrarás outros viajantes como tu para fazer amizades e trocar experiências. Os diferenciais deste hostel é que disponibiliza área para piqueniques e a piscina para recreação. As instalações do hotel são modestas, mas charmosas. Lá servem café da manhã e prestam serviços de lavandaria. Caso pretendas um quarto exclusivo para não fumadores e ar condicionado, então gostarás do Sharon Inn. Fica próximo ao Templo do Dente e ao lago de Kandy. Que tal acordar, olhar pela janela e contemplar a vista e o ar puro da natureza? As instalações e os móveis de madeira dão um toque especial e sofisticado ao hotel. Se estiveres disposto a pagar um pouco mais e desfrutar de comodidades, tipo banheiras de hidromassagem e vistas surreais, o Viyana Boutique Hotel é o teu lugar. O Elegant Hotel entra na mesma linha do outro e mais um pouco. Ele é encantador, imagina-te numa área privada a relaxar. Pois bem, o Elegant Hotel oferece isso e um pouco mais. Fica localizado próximo ao Jardim Botânico de Kandy. Kandy sempre sofre com as temporadas de monções. Evita ir entre abril e setembro e nos meses de outubro e novembro, em que ocorre a monção Maha. A melhor época para visitar em Kandy é entre meados de dezembro até meados de março. Queres saber mais sobre as monções e em quais partes da ilha ele atinge? Confere esse artigo completo sobre o clima no Sri Lanka. Como vimos, Kandy é uma cidade encantadora e que merece a tua visita. Kandy não é somente uma ponte paraviajar de comboio para Ella. 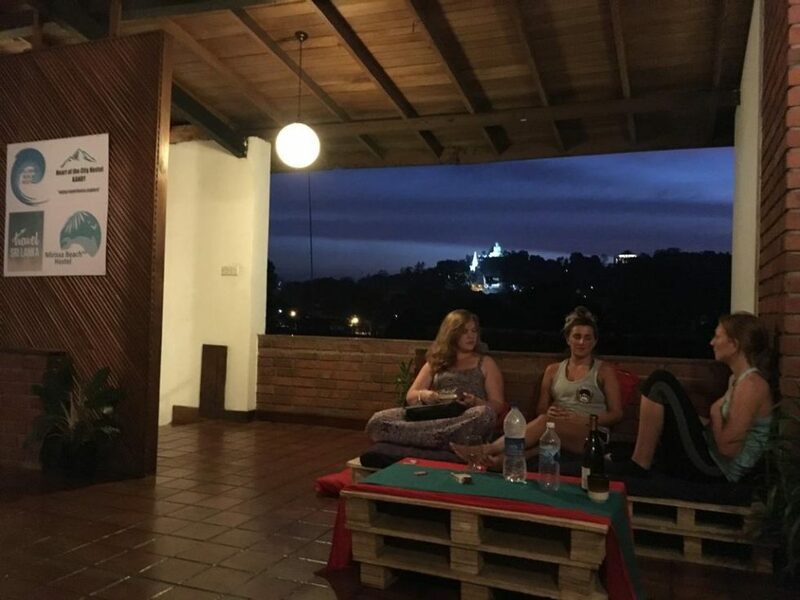 Kandy é uma cidade que merece parares um pouco e, conforme a tua vontade, escolher entre as principais atrações desde as festas mais agitadas aos lugares mais relaxantes. Programa para ficar uns 3 dias e garantimos que ainda será insuficiente. As atrações são tão ricas e emocionantes que fica impossível descrever todos os sentimentos. Como podes ver, a religiosidade, a cultura e a preservação ambiental são características predominantes em Kandy. Esse lugar revela uma cultura ímpar e não é à toa que Kandy foi declarada Património da Humanidade pela Unesco. Gostaste de Kandy no Sri Lanka? Viste como é reveladora e com todas as emoções ao mesmo tempo? Confere as outras cidades e traça o roteiro completo na tuaviagem ao Sri Lanka.